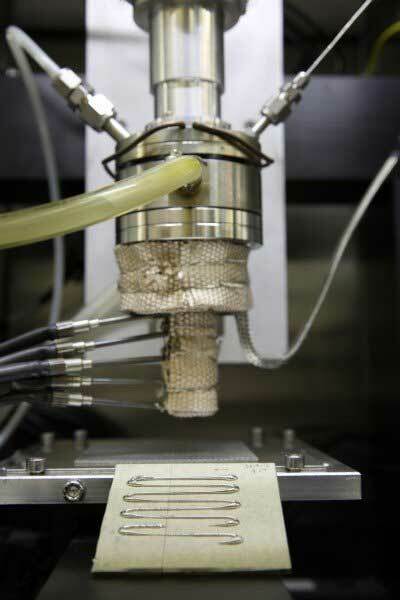 (Nanowerk News) Metal 3D printing has enormous potential to revolutionize modern manufacturing. However, the most popular metal printing processes, which use lasers to fuse together fine metal powder, have their limitations. Parts produced using Selective Laser Melting (SLM) and other powder-based metal techniques often end up with gaps or defects caused by a variety of factors. To overcome those drawbacks, Lawrence Livermore National Laboratory researchers, along with collaborators at Worchester Polytechnic Institute, are taking a wholly new approach to metal 3D printing with a process they’re calling Direct Metal Writing, in which semisolid metal is directly extruded from a nozzle. The metal is engineered to be a shear thinning material, which means it acts like a solid when standing still, but flows like a liquid when a force is applied. The results of the ongoing three-year study were published in Applied Physics Letters ("Direct metal writing: Controlling the rheology through microstructure"). Unlike other metal 3D printing techniques that use lasers to fuse metal powder, the Direct Metal Writing approach incorporates an ingot that is heated until it reaches a semi-solid state before it’s forced through a nozzle. As it cools, the material hardens to form a 3D metal structure. Instead of starting with metal powder, the Direct Metal Writing technique uses an ingot that is heated until it reaches a semi-solid state—solid metal particles are surrounded by a liquid metal resulting in a paste-like behavior— then it’s forced through a nozzle. The material is shear thinning because, when it’s at rest, the solid metal particles clump up and cause the structure to be solid. As soon at the material moves, or is in shear, the solid particles break up and the system acts like the liquid matrix. It hardens as it cools, so there’s less incorporated oxide and less residual stress in the part, the researchers explained. While encouraged by their success in printing test pieces, the researchers cautioned the method is still in its early stages and will need more work to achieve higher resolution parts with more industry-friendly metals, such as aluminum and titanium. In the paper, the team produced parts using a bismuth-tin mixture, which has a low melting point of less than 300 degrees Celsius. The process took numerous iterations to get right, as researchers ran into the problem of dendrites—fingers of solid metal that would get stuck in the nozzle. The researchers said the latest study will provide accurate operating conditions for printing with metal directly from a nozzle. They’re already moving onto aluminum alloys, a metal that would be more attractive to industries such as aerospace and transportation, but will present challenges because of its higher melting point.